This year, the Children’s Day celebration in our school was a bit different. There was the usual quota of dances and plays and picnic. But the real fun began after all this was over. A rather unusual competition was held. Each house from each class was asked to make something out of waste materials. When we initially heard of this, we were rather irritated. How could we possibly make anything presentable out of discarded materials? I am the leader of the Violet House of our class, but I washed my hands of the matter entirely. Then one of the other girls took charge. She chalked out a very innovative idea. 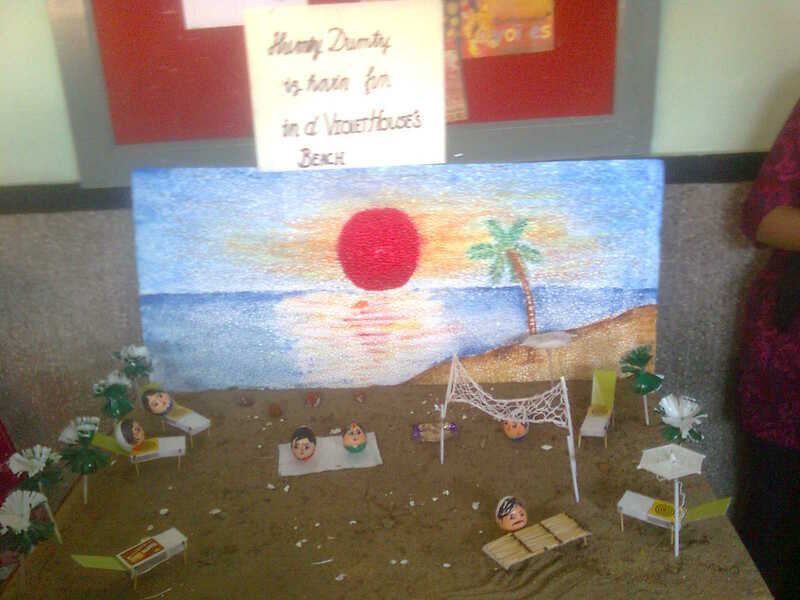 We were going to make Humpty-Dumpties spending a day out on the beach. This caught my attention, and slowly my interest in the competition revived. I shall not go into all the planning and fighting and bossing that went on in the days before the competition. On the day of the competition, this Saturday, we went to school with all the materials. To tell the truth, I had forgotten all about it the previous day, and remembered about the green wrapping paper that I was supposed to bring only at the gate of the school. Fortunately, I had money with me, and some of the roadside shops had already opened. I managed to get some sellotape and had to make do with some green marble paper. My friend Srimoyee is a wonderful craftsman. She had made a beautiful background of the setting sun on the sea on a used sheet of thermocol. She had also made some beach shades by winding thread around a used pen’s refill. There was even a volley ball net made with intricate designs out of that same thread. This one was made by her aunt though. But what was most remarkable was that she had ever so carefully drilled holes into seven eggs, taken the yolk out, washed the shells clean and painted them into Humpty Dumpties! We were so amused and also amazed when we first saw them! The poor girl had had to work late into the night to do all that work. All the different houses chose their own space to work in. The Violet house girls of our class were the fastest, and bagged the best space available; a raised platform right outside our school library. One of the girls had brought a huge cardboard box which once contained their new T.V. That became the base of our beach. One of my friends and I acquired some sand from the garden next to the convent, and that formed our beach. Soon, all of us were very deeply engrossed in our work. We had been given one hour, but we could easily bet on an extra half hour. I along with one of the girls started making some trees for our beach. At first we were a bit confused about how we could make them, but then I had a sudden brainwave. We used old refills (Shivangi had brought a large number of those) as the trunk. The green marble paper was used to cut out circles whose edges were fringed. Then, two such circles were placed opposite to each other that it looked like two ice-cream cones stuck on the pointed sides. This was then attached to the refill and voila! Our tree was ready! 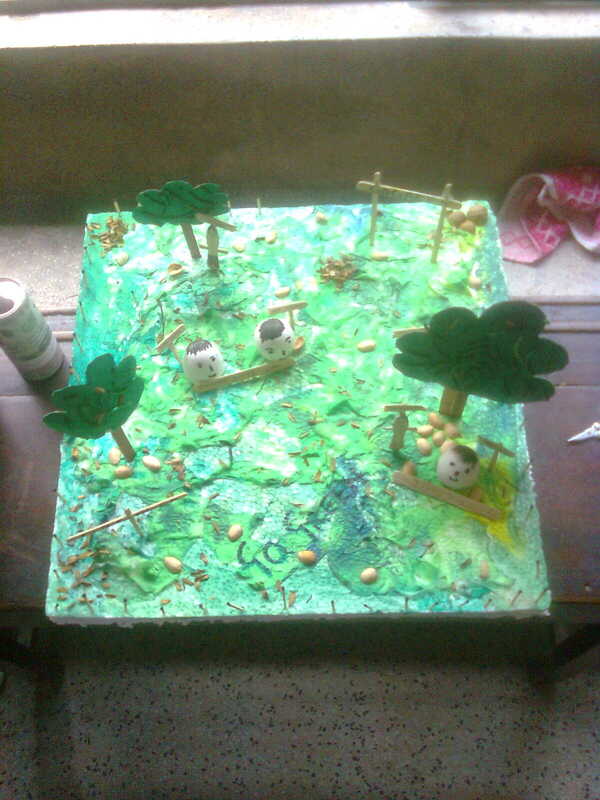 We made eight such trees. In the meantime, few of the others were making beach chairs and lemonade stalls with old match boxes and used matchsticks and ice-cream sticks. A piece of torn jute sack was used as a mat, and two Dumpties were placed on them. Two more Dumpties played volleyball and two more rested on the chairs. The last one sold lemonade. We even put a piece of used lemon that one of the girls had brought on the stall! After we were done, the beach looked beautiful, and I am not saying that because we made it. Even our opponents agreed that ours was the best in class. The other houses had nice ideas as well. Red House depicted a village scene. 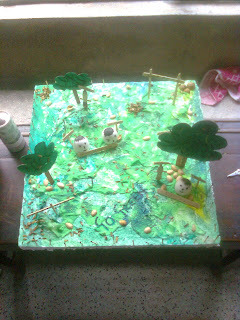 Green House did a project on the theme ‘Go Green’. 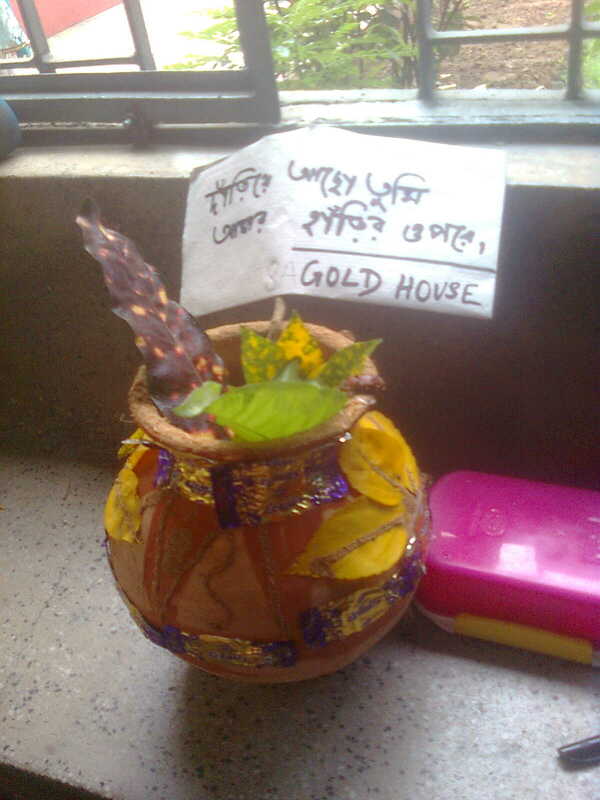 Gold House decorated a used pot with chocolate wrappers and coconut shells. They put a dead beetle on the pot (though Heaven alone knows why a dead beetle should be considered waste material!) and put the caption ‘Dariye achho tumi amar harir opore’! We had a good laugh trying to imagine Robi Thakur’s reactions had he seen the latest version of his poem! Some of the other classes had made pretty things too. Among numerous projects, there was one which showed the lost city of Atlantis. One was a submarine whose fans were attached to an electrical circuit and actually moved. There was the Dhamekh Stupa of Sanchi. 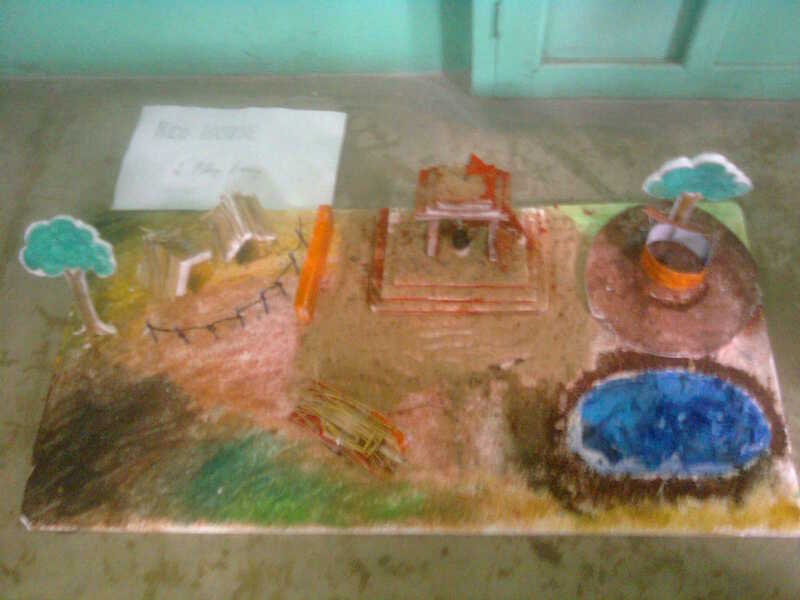 Somebody even did a presentation of the Harappan civilization! It was amazing how many innovative ideas could come out when minds are forced to work. All in all, it was positively one of the best days that I have spent in all these years. The fun and laughter was there, and add to that the anticipation of winning a competition where so much of hard work and dedication and team spirit has been put in, and your day is made. I'm gladdened to hear that you had such an enjoyable day at school with your friends and with the project. The narrative itself is frank and amusing (I keep seeing you first 'hrrmphing' about the project and then standing near the school gates realising you'd forgotten to bring your bit of the beach...and then making those lovely fringy, flouncy trees...). I'm wondering whether Gold House had been planning to find a dead beetle all along...or was it a sheer stroke of luck. That beetle somehow makes the pot. One of the Houses made a submarine...and one that moved?! Wow. The Violet House project looks extremely neat and interesting. Quite amazing that the girl managed to preserve the egg-shells. I remember a friend from school who made a lovely salad with a Humpty Dumpty sitting on a wall of potato set in a garden of carrots and cucumbers and tomatoes...we munched on Humpty's garden and a couple of the girls ate Humpty later (I may have been one of the offending members). And someone else tried building the Sanchi Stupa....that one didn't go well. She made a mistake with the basic architecture of the stupa. Hmm. I do, do hope that you have some other days in school filled with good clean fun, merriment, and running around and laughs and good cheer.